At least 14 UN peacekeepers have been killed and 53 wounded in an attack in the east of the Democratic Republic of Congo. 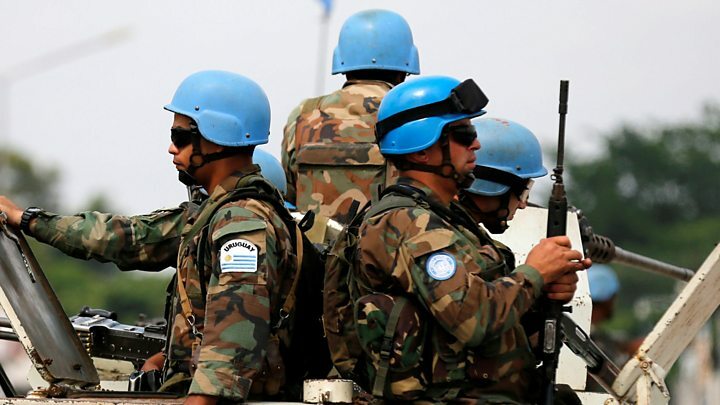 The UN’s Monusco mission said the peacekeepers were attacked by suspected rebels of the Allied Democratic Forces (ADF) in North Kivu province. Five Congolese soldiers also died. UN Secretary-General Antonio Guterres said it was the worst attack on UN peacekeepers in recent history and amounted to a “war crime”. “I want to express my outrage and utter heartbreak at last night’s attack. There must be no impunity for such assaults, here or anywhere else,” he said. Eastern DR Congo has suffered years of instability with rival groups fighting for control of territory. A Monusco statement said rebels had launched an attack against an operating base at Semuliki in Beni territory on Thursday evening. “This resulted in protracted fighting between suspected ADF elements and Monusco and FARDC [Congolese] forces,” it added. Writing on Twitter, Jean-Pierre Lacroix, Under-Secretary-General for Peacekeeping, said reinforcements had been sent to the scene and medical evacuations were under way. Outraged by the attack against @MONUSCO in #NorthKivuDRC last evening, where a large number of @UNpeacekeepers have been killed & wounded. Our thoughts & prayers with families & our colleagues in @MONUSCO. Reinforcements are on scene & medical evacuations by Mission ongoing. Tanzanian President John Magufuli said he was “shocked and saddened” by the news. Suspected ADF rebels killed two peacekeepers in October, a BBC correspondent in Kinshasa says. Monusco is the UN’s largest and most expensive peacekeeping operation and has been in operation since 2010. However, earlier this year the UN revealed a plan to cut the number of peacekeepers there from about 19,000 to 3,000. Several UN member states have signalled a desire to cut spending on peacekeeping. Monusco has also faced violent demonstrations by civilians, who accuse it of being ineffective. Media captionWhat are UN peacekeepers doing in Africa? Several armed militias are fighting for control of mineral-rich lands in North Kivu and often clash with Congolese troops and UN peacekeepers. Earlier this week, aid agencies said that conflict had forced 1.7 million people in DR Congo to flee their homes this year. The Norwegian Refugee Council’s DR Congo director, Ulrika Blom, described the situation as “a mega-crisis”. “The scale of people fleeing violence is off the charts, outpacing Syria, Yemen and Iraq,” she said. The killing of the Tanzanians, and several government troops, happened in a part of eastern Congo which has seen some of worst massacres over more than two decades of conflict. It is an area rich in mineral wealth and has seen interventions by neighbouring countries and a proliferation of warlords and militias whose common currency is a ruthless disregard for human life. All have contributed to the destabilisation that plagues the area. The UN base was allegedly attacked by the Allied Democratic Forces – a militia whose roots are in Uganda but which now ranges across the borderlands between the two countries. The group is described as Islamist but, as with most of the groups in this area of great poverty and perpetual instability, motivations for attacks can be more varied than purely sectarian. Conflict in Congo has continued to displace hundreds of thousands of people with violence erupting in different provinces – from the long running strife in the east to more recent conflagrations in Kasai and Tanganyika. President Joseph Kabila has refused to step down despite completing the two terms in office allowed under the constitution – though elections are promised next year. Amid the growing tension the UN has just under 20,000 troops in a country two thirds the size of Western Europe. And even this force is being cut back as the US seeks to reduce the UN peacekeeping budget.